WASHINGTON People around the world will celebrate the Lunar New Year on Jan. 24, 2001. According to the Chinese lunar calendar, that day marks the beginning of the Year of the Snake. On Jan. 20, the U.S. Postal Service will mark this occasion with the issuance of the ninth stamp in the award-winning Lunar New Year series. A first day of issuance ceremony will be held at 11 a.m. at the Asia Pacific Cultural Center, Pacific Renaissance Plaza, 388 Ninth St., Oakland, CA. The stamp will be available nationwide on Jan. 21. "The issuance of this postage stamp gives the Postal Service an opportunity to recognize and honor the diversity of our nation," said Benjamin P. Ocasio, Vice President, Diversity Development, U.S. Postal Service, who will dedicate the stamp. "We recognize that the rich histories and traditions provided by the diverse cultures of each and every American help make this a strong nation, just as the Postal Service helps strengthen America by binding the nation together with universal mail service I am honored to help dedicate the Lunar New Year stamp." Oakland Postmaster Lawrence Barnes will serve as master of ceremonies for the event. Joining Barnes and Ocasio will be the Honorable Jerry Brown, Mayor of Oakland, and Jolie Bales, Managing Director for the Asia Pacific Cultural Center. Other participants will include George Ong, National President, Organization of Chinese Americans, Hiroko Kurihara, Board President, Asia Pacific Cultural Center, and Claudine Cheng, Past National President, Organization of Chinese Americans. The snake, the sixth of twelve animals associated with the Chinese lunar calendar, is a symbol of wisdom and charm. Known for excellent manners, people born in the Year of the Snake are said to be intelligent, philosophical, elegant, and romantic. The first stamp in the Lunar New Year series of twelve was Year of the Rooster, followed by Year of the Dog, Boar, Rat, Ox, Tiger, Hare, and Dragon. Also called the Spring Festival, the traditional Chinese New Year celebrates the beginning of a new season. It is a time of renewed hope for a prosperous future. In the United States many people enjoy the colorful festivities that the Chinese New Year brings. The Year of the Snake ends Feb. 11, 2002. To commemorate the Year of the Snake, artist Clarence Lee created an intricate paper-cut design of a snake. The Chinese characters-drawn in grass-style calligraphy by Lau Bun-translate into English as "Year of the Snake." The greeting "Happy New Year!" is in English. Clarence Lee, an American of Chinese descent, was born in Honolulu, HI. After attending Pomona College in Claremont, CA, Lee transferred to the School of Art and Architecture at Yale, receiving a bachelor of fine arts degree in 1958. He worked as a designer in New York before returning to Hawaii in 1966 to open his own design firm. In 1992, at the request of the U.S. 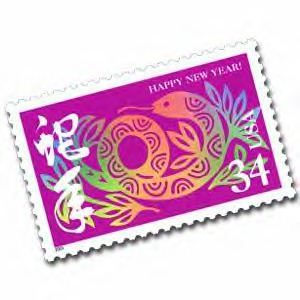 Postal Service, Lee designed a stamp commemorating the Chinese Lunar New Year. Issued Dec. 30, 1992, the Year of the Rooster stamp was the first in a series featuring each of the twelve animals associated with the Chinese lunar calendar.